The Legal Genealogist would never have thought of going to Philadelphia to research her North Carolina ancestors. Or to consider in more detail the death of George Washington at his beloved estate Mount Vernon in northern Virginia. Or even to look into wills and deeds from early settlers of southern New Jersey. There are other more obvious candidates for that kind of research, right? Because there are treasures to be found in Philadelphia in each of those outside-of-Philadelphia topics, and some of them can’t be found anywhere but in Philadelphia. The Library of The Historical Society of Pennsylvania, a repository I hadn’t visited before I was asked to speak there last night and introduce its members and library patrons to the use of DNA as part of our genealogical toolkit. I have the good fortune to be friends with several members of the Greater Philadelphia Area chapter of the Association of Professional Genealogists and one of them, Sandra Hewlett, arranged to have me given a tour of the HSP library by Lee Arnold, Senior Director of the Library and Collections. To say I was stunned at the scope of the HSP Library’s holdings is to understate things by a pretty fair margin. But I didn’t expect the entire rooms of volumes on other states, not just those in the mid-Atlantic region but from farther afield — including shelf after shelf of works focusing on North Carolina, the result of a bequest to the HSP library by one of its members who lived in Philadelphia but had been born in the Tarheel State. And I certainly didn’t expect to see a document bearing the original signature of Lorenzo de Medici, a Florentine who lived during the Italian Renaissance, dated 1479! 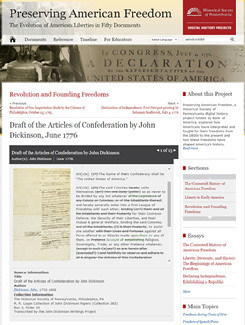 • An original of a draft of the Articles of Confederation, prepared by John Dickinson in June 1776. • An original of a very early draft of the United States Constitution, prepared in Philadelphia in the summer of 1787. • A handwritten copy of The Star-Spangled Banner, penned by Francis Scott Key and given by Key to a friend, a Pennsylvania military officer and U.S. Representative named William H. Keim, around 1840. • A printed copy of the Emancipation Proclamation, personally signed by Abraham Lincoln and his secretary of state William Seward. • William Still’s Journal C of Station No. 2 of the Underground Railroad, with its names and detailed descriptions, dates and family details of the runaway slaves who came through that station in 1855. • The very first photograph ever taken in the United States, a daguerrotype image of the Central High School for Boys and the Pennsylvania State Arsenal, dating from the fall of 1839. These documents, and many others, are available online. But the vast majority of the 21 million items held by the HSP and its library are not digitized. For some, the only cataloguing is a card catalog on the library’s main floor. So it’d be easy, all too easy, even for folks like me who live close by in a neighboring state, to overlook the HSP Library or to think that it’d be too hard to use it. But the key lesson to be learned from last night is a basic one for all of us as genealogists and researchers: we need to think outside the research box, and particularly outside of the geographic box, and to get out of our chairs and off our computers. The reality is that, because of the mobility of our ancestors and donations by members and patrons, any library — one like the HSP Library or a university library or a public library — anywhere in the country, indeed anywhere in the world, might have part or all of the answer to a perplexing family mystery a long way away from where that mystery played out. And those library holdings, for the most part, are not online. So while it may be that North Carolina is where we’ll find other more obvious candidates for North Carolina research. But let’s not ever overlook places like Philadelphia. Seattle Genealogical Society Library has a donated collection of New Jersey materials ! I found info there on my husband’s family, thousands of miles away from NJ. A perfect example! SGS has a wonderful library, as does the Genealogical Forum of Oregon. There are a LOT of these libraries with fabulous holdings and we can’t afford to overlook them. I have heard great things about their fire insurance records, and last night I happened to find a bit in a deed book that an ancestor with a bottling business bought fire insurance from a company with records on file there. I just want to round out my research online so I have as much information as possible before I go, but it looks like I’ll be making a trip there this spring. Yep, their holdings could be just what you need, Christie! Good luck! And isn’t it wonderful that they have information Online and have partnered with online resources to make them available to even a wider use base. And, it’s a pretty nice place to visit, the “rest of the iceberg”. This says pretty much what I was going to add. In an ideal world a list of holdings, at least, would be online. But I emphasize the word “ideal,” knowing that we’re talking about volunteer time and large holdings and, and, and… ! The reality is often very far from the ideal, Dave, as you’re noting. But we can all pitch in and do our part, even just a little. …like with the previously noted digitizing project through the National Archives! What a great reminder to all of us that sometimes what we’re looking for isn’t where we expect it! GREAT suggestion, Laura — there are always unprocessed materials! Sounds like it to me, Claudia! Thanks for a wonderful presentation on DNA last night. Gave me lots of ideas on others to test with different companies. Glad you got to see some of the great holdings at HSP. I worked there for one semester in college and loved spending my lunch hour browsing the stacks for records of my ancestors. Their holdings are incredible and cover a vast area as you say in your post. Happy that you got to visit this great repository and learn about what is available to researchers here. Thanks so much for the kind words, Donna. It was a wonderful evening all the way around. I made a trip to Philadelphia several years ago just to do local research. Had a wonderful time at the Historical Society. Found some church records that told me that my Germans were Lutheran not Catholic and gave me some more direction. Another place to check is the Kansas State Historical Society. They were started by people with New England ancestry and have a great collection from there as well as other places to the East. Most of their collection is also not cataloged online. Due to large budget cuts the staff has been cut drastically and so has their budget to buy books. However their older materials are fantastic and they do accept donations. If looking for Kansas it’s a must visit. They have the best collection of state newspapers. It’s one of the things I miss about Philadelphia. I Moved to North Jersey from the Philly area a few years ago and thought I would have withdrawals from the HSP. I was always there researching my Pennsylvania, New Jersey and Delaware roots. It is a fantastic place to visit. I can sure understand how it would be high on the list of things you miss. A truly amazing resource.